We are approaching the end of our Conservation E-learning project, with a completed trial resource being prepared to go to our first focus group. 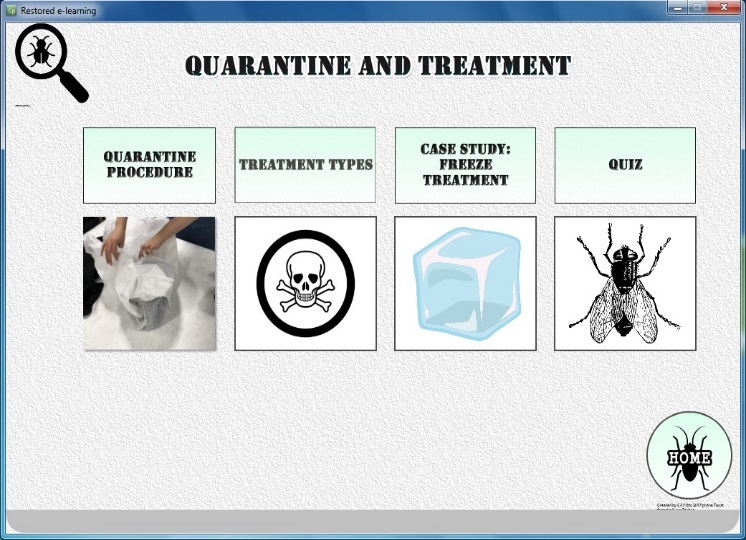 The resource focuses on providing the user with an introductory level of knowledge of Integrated Pest Management, with a focus on the problem of insect pests in Special Collections storage. 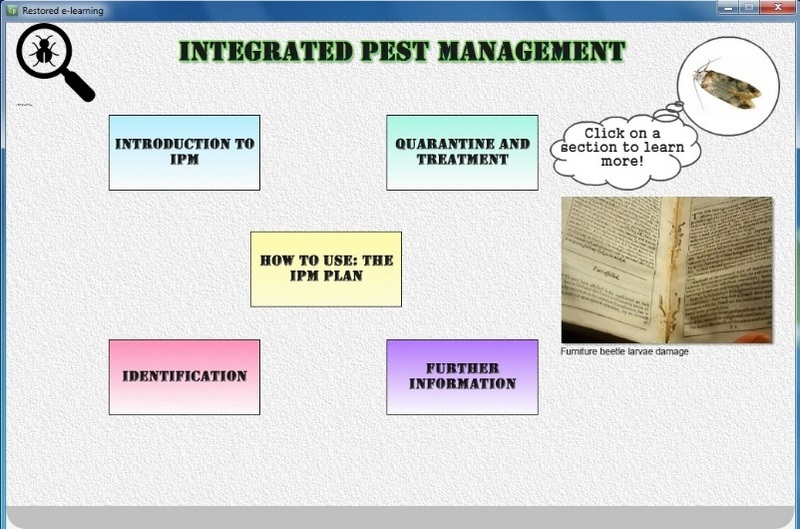 More specifically, the resource aims to provide a wider knowledge of the following: an introduction to Integrated Pest Management (or IPM), how an IPM plan is implemented, pest identification procedures and the quarantine and treatment procedures within an institution. The resource is menu driven, with a focus on user-directed, navigational learning. The user has an option to click through the resource in order, starting with the Introduction to IPM section, or to return to the main menu at the end of each section to choose which section they would like to learn about next. 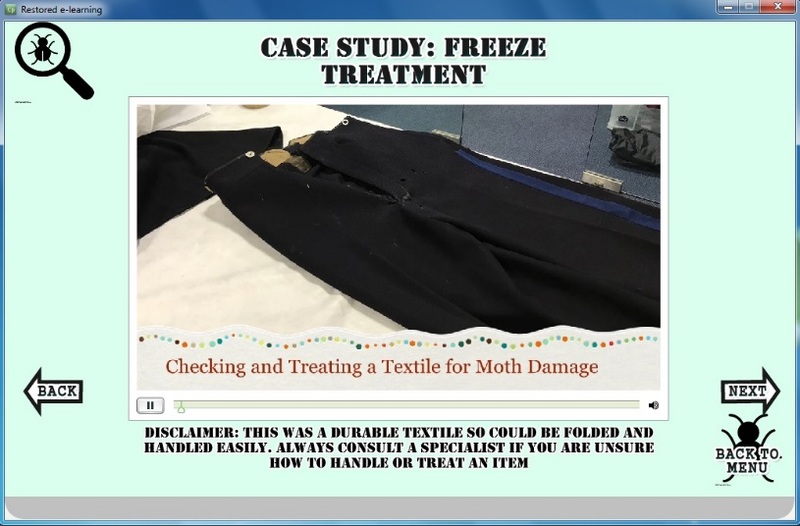 The resource pays particular attention to interactivity and use of different media to convey the importance of an effective Integrated Pest Management plan to the storage and conservation of special collection items. 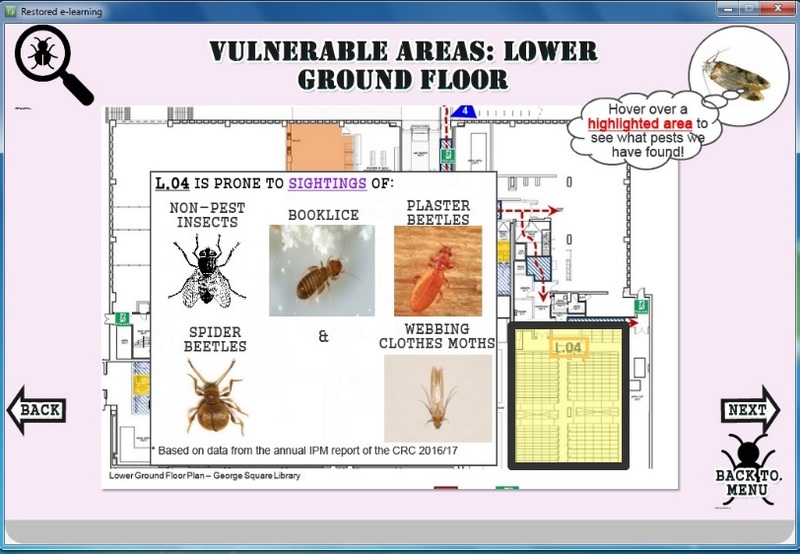 For example, in the pest identification section, we have included an interactive, visual representation of the floorplans in the Centre for Research Collections here at the University where the user can hover over a storage unit or area in the CRC to see what kind of pests were found there in the previous year. This was created with the aim to provide a better general understanding of the common pest problems found within the CRC specifically, and special collections storage as a whole. 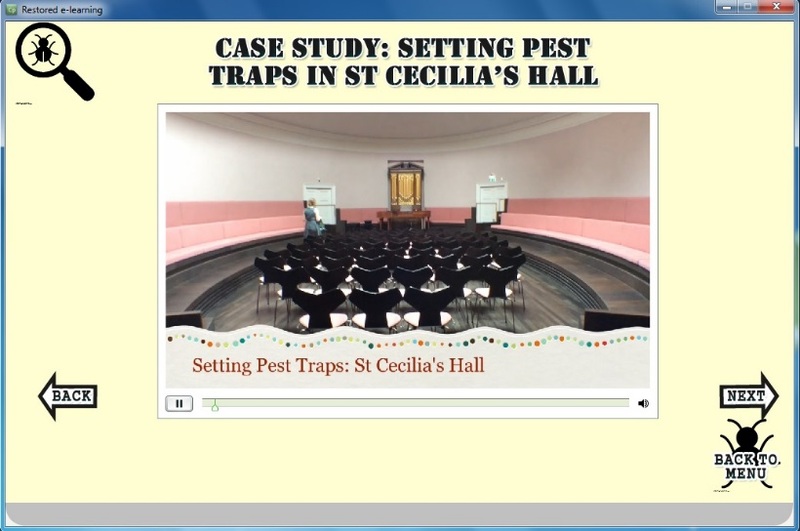 Moreover, we made use of tutorial style videos detailing the process of planning and setting pest traps, using the newly refurbished St Cecilia’s Hall as a case study, as well as the process of quarantine and treatment, using a band uniform with moth infestation damage as a case study. The software I have been using to create the resource, Adobe Captivate, specifically caters to creating e-learning resources and has multiple inbuilt templates for quizzes and games that I was able to utilise, with the help of tutorial guidance through Lynda.com (free access for University of Edinburgh staff and students) . While we had a few bugs with the software along the way, it proved very useful for simplifying what would have been complex syntax into simple templates, to be inserted into the resource as needed. 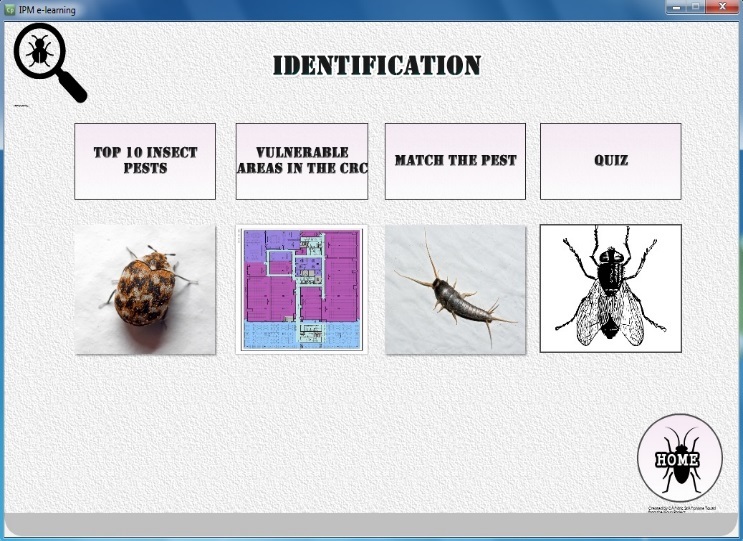 This e-learning resource will be used for internal training on Integrated Pest Management in the CRC. However, moving forward from this project we hope that the experiences gained can be utilised in future e-learning ventures, from trials and tribulations with software to experimenting with various media, to provide a model for creating future e-learning resources to convey and inform of the importance of conservation and collection care. This entry was posted in Internships, Preventive Conservation and tagged Centre for Research Collections, e-learning, Employ.ed, Integrated pest managment, preventive conservation by conservation. Bookmark the permalink.